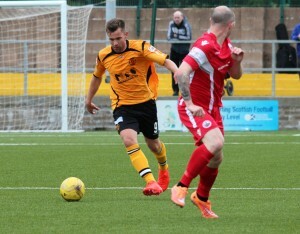 Annan kicked off their Ladbrokes League Campaign with a fine victory over Stirling Albion at Galabank on Saturday. After their midweek misery over Celtic this was more like it from Annan but they had to sustain an agonising opening 15 minute spell when the Binos ran Annan ragged and it came as no surprise when Sean Dickson put the visitors ahead in the 12th minute. Annan looked to be heading down the road to defeat but they responded magnificently to the challenge to score three goals before the interval and secure a 3-1 interval lead. Stirling started very well taking the game to Annan but when they opened the scoring in the 12th minute it was a real sucker goal for Annan to lose after the hosts were awarded a free kick at the opposite end. Stirling defended the situation and broke quickly with a swift move down the right where Eddie Ferns skipped past the challenge of Jean Guy Lucas to cross to the unmarked Sean Dickson who’s initial effort was blocked by Currie but Dickson following up had the simple task to slot the ball into the empty net. It was a lead which was to last 5 minutes and it was their man of the match Rabin Omar who was at the heart of the goal when he picked up a lost cause ball wide on the right but he managed to bring the ball under control won himself a little space to send in a dangerous ball to the near post and Ross Forsyth had the misfortune to get a touch on the ball to divert the ball into his own net. Annan had a scare in the 21st minute when Blair Henderson’s effort from 16 yards crashed off the front of the cross bar. Stirling Albion were dangerous on the break and in the 29th minute Mark McKenzie burst into a good position but the final shot was disappointing and was easily saved by Currie. At the other end Ryan Finnie finished a decent build up with a poor shot. Annan went ahead in the 30th minute with a well constructed move ending with a clinical low 12 yard shot from David McKenna which beat keeper Cammie Binnie. Annan were enjoying a good period in the match and in the 41st minute they increased their lead when Queen of the South loan signing Aiden Smith got his head to a Max Wright corner to score from 2 yards to give Annan a 2 goal advantage. Annan started the second half taking the game to Stirling and how the Stirling goal survived unscathed in the 55th minute was a mystery when Annan had a couple of shots cleared off the goal line and they appeared to have real claims for a penalty brushed aside when Raffi Krissian’s shot appeared to be handled on the goal line. However the ball broke and the play swiftly moved to the other end of the Park where Mark McKenzie ‘s shot appeared to take a deflection off an Annan defender to pull a goal back for Stirling Albion. The goal settled Stirling and Currie needed two attempts to deal with McKenzies shot in the 62nd minute as the visitors searched for an eqauliser. Darren Ramsay’s well struck shot in the 65th minute was saved by Binnie. Both teams made substitutions but scoring opportunities were few and far between. There was not a lot between the teams with both teams still searching for their best formations. Annan probably just did enough to justify the victory, there was some excellent performances particularly from newcomers Darren Ramsay and Aiden Smith with Rabin Omar a constant threat down the right. Annan manager Jim Chapman has assembled a new squad with some exciting newcomers and it will be interesting to see how they adapt to the season ahead, going by Saturdays results it looks like it will be a very competitive league. Annan Athletic : Blair Currie, Steven Black, Jean Guy Lucas, Raffi Krissian , Peter Watson, Darren Ramsay, Rabin Omar ( Premyslaw Dachnowicz ), Ryan Finnie, David McKenna ( Liam Park 65 min), Max Wright, Aidan Smith . Substitutes not used – Alex Mitchell, Adam Ashgar, Scott Norman, Stuart Sharkey, Tony Ribeiro. Stirling Albion : Cammie Binnie, Jamie Mills ( Jack McCue ht), Bryon Hodge, Mark McKenzie, Blair Henderson, Darren Smith, Eddie Ferns, David Verlaque (James Fowler 84 min), Scott Davidson, Sean Dickson, Ross Forsyth. Substitutes not used Ronan Fallons GK, Ross McGeachie, Aurelign Mazel, Sam Davidson, Alex Docherty. Assistants Andy Milne and Ewan Birch.